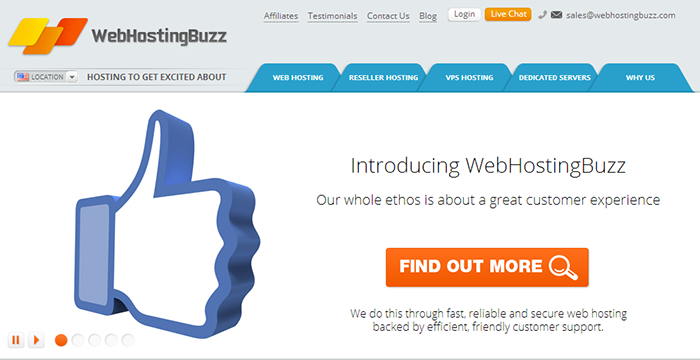 WebHostingBuzz is a newcomer to my top 10 hosts, but they are not new to web hosting by any means. They have been around since 2002 and have expanded to offer a pretty wide variety of hosting services. They offer a web hosting package to suit pretty much any website, from shared hosting to reseller and dedicated servers. WebHostingBuzz is a little more expensive than their competitors, and their most basic shared hosting package is more restrictive than others, but they do offer an infrastructure that allows you to grow your website without having to worry about transferring to a different hosting company. This is especially important for business websites that rely on uptime. It allows you to avoid the hassle of moving your files and domain name from one company to another. I did not need any space to grow, so my review is only based on the most basic shared hosting plan. As I touched on a bit above, WebHostingBuzz’s most basic plan is a bit more restrictive, and pricier, than their competitors. While they do offer a lot of different packages, it does seem like they are intentionally structured to force you to upgrade sooner than most other hosts might. Their packages are very similar to the way HostGator is structured, which I am not a very big fan of. I also have a strong feeling that some of their support, at least live chat, is outsourced. The WebHostingBuzz prices are a little higher than most of their competition, but unlike many competitors they do not raise the renewal prices. This is why they do not offer such low rates at the time of sign up. In the long run it pays off to have a package like this because you don’t get hit with renewal rates that are three times as expensive. WebHostingBuzz has the same “unlimited” marketing plan that most hosts do. They are also pretty vague on explaining what limits there are to the unlimited resources which forces you to go digging through their Acceptable Use Policy before finding any type of information. Another factor which I think holds them back is their most basic plan only allows you to host two websites on the account. If you want to host more you have to upgrade to their next package which is significantly more expensive. Most other hosts (outside of HostGator) allow you to host as many websites as you’d like on their most basic account. This, to me, is a restriction placed on a package simply to get customers to upgrade. 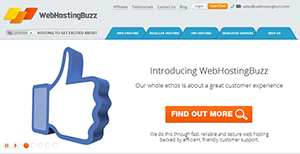 WebHostingBuzz is generally reliable. I have had a few different instances of downtime on my account, but none of them have lasted more than 9 minutes. 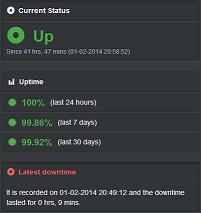 Over the past 30 days I have an uptime of 99.92% which is a pretty solid number. This is good enough where you won’t have to worry about a business website being down for any significant amount of time. The server response time is a bit slower than others, however. I attribute this to being on a server that is more populated due to it being the most basic web hosting package they offer. The speeds are far from slow, but my test websites have taken a bit longer to load, on occasion. In short, the support team is very hit or miss. Their live chat is either outsourced or they just don’t care that much about grammar. 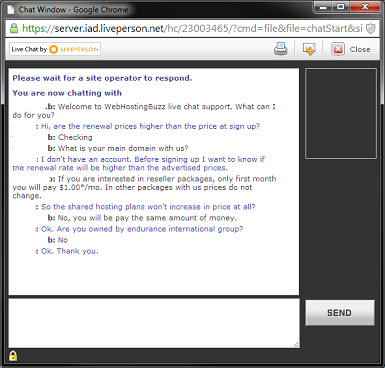 The screenshot to the right is from a live chat I opened a couple of days ago asking a few simple pre-sales questions. What you can’t see is that this seemingly simple chat with only a couple of questions that should be easy to answer took almost 10 minutes. Their support is much of the same. Sometimes you will get a tech who will be knowledgeable enough to answer your questions, and other times they will have to ask you to wait while they (most likely) check with someone else for the answers. Of course, the more in-depth your support questions the more likely you are to get pushed to a different form of support. WebHostingBuzz is a good choice if you are an experienced customer who won’t necessarily rely on needing tech support to get your website set up. They are especially good if you plan on having your website expand relatively quickly and are going to need to upgrade to a virtual private server or dedicated server. If you are a beginner who is looking to set up your first website for relatively cheap you may want to look at a host that offers better support.